Welcome to KDS Dream Boers! We are Kevin & Diona, our kids, Bailey and Keagen have been in 4-H since they were very first able to, they then moved into FFA! They enjoyed showing and selling goats, and have now both graduated; Bailey in 2014 and Keagen in 2017. We are located in Kennewick, WA on 5 acres in a rural community called Finley (just east of Kennewick). We purchased this land and home in May of 2002 and started with a few Suffolk ewes and started growing! In the spring of 2003 we acquired our first goat and fell in love. 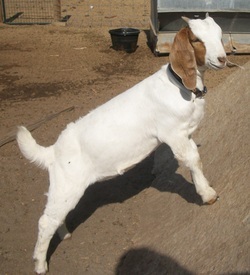 In the early spring of 2006, we decided that Boer goats were the path that we wanted to take. I sold off quite a few of my dairy and pygmy stock and started looking around for some quality registered and commercial boers. On May 1, 2008, we sold the last of the ewes and ram! It was a fun and great learning experience. Bailey decided that she wanted to start raising Nigerian goats. In February 2008 she purchased a pregnant Nigerian from Andrea Green. "Libby" kidded in March with 2 adorable doelings! April 25, 2008 she purchased 2 registered does and a buckling from Jen Tarlton. Bailey was well on her way! She became a member with the American Goat Society and American Dairy Goat Association. Over the years, Bailey has continued to add some beautiful animals to her herd. Bailey's farm name is "Bay's Dream Goats". My Boers have also grown in numbers and we started showing, it truly is exciting to be out in the show ring. There is still alot to learn, but we are committed to increase our knowledge and learn to breed a better quality boer. With Keagen having a standard Toggenburg for his fitting & showing goat, we needed to bring her into milk. Prior to the Boers, I had raised Mini Oberhaslis, so I was well aware of the mini goats and still loved them. I thought since Bailey had nigies and we didn't need a standard Toggenburg, why not breed her to a nigie? This started our experiment with the mini Toggenburgs. It took us 3 years to figure out which buck to use on her to get the correct colors, but once we did...oh my, her babies started wowing the judges. At this point, we have only kept 3 does and have been lucky to lease Cherry Butte Curious George for a couple years (2015 & 2016). Please Enjoy Your Stay ~ and Thank You for stopping by to take a look! When you are finished here, please take a look at Bailey's site! Click on picture to go visit some beautiful Nigerian Dwarf Dairy Goats!